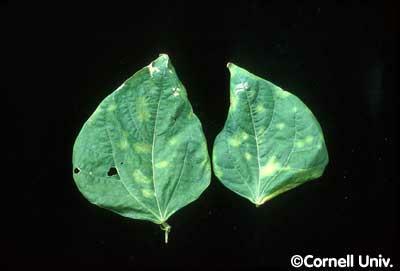 Strains of P. syringae are noted for their diverse and host-specific interactions with plants (1,2). Specific strains are assigned to one of the over 40 known pathovars, based on their ability infect different plant species. 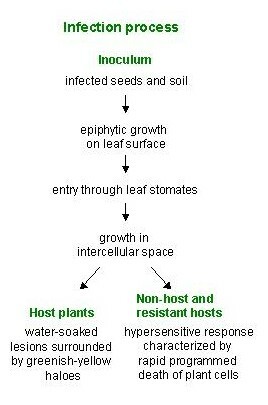 They are then further assigned to a race based on differential interactions among cultivars of the host. 1. Hirano, S. S., and C. D. Upper. 2000. Bacteria in the leaf ecosystem with emphasis on Pseudomonas syringae-a pathogen, ice nucleus, and epiphyte. Microbiol. Mol. Biol. Rev. 64:624-653. 2. Rudolph, K., T. J. Burr, J. W. Mansfield, D. Stead, A. Vivian, and J. von Kietzell. 1997. Pseudomonas syringae Pathovars and Related Pathogens. Kluwer, Dordrecht. 3. Fillingham, A. J., Wood, J., Bevan, J. R., Crute, I. R., Mansfield, J. W., Taylor, J. D., and Vivian, A. (1992). Avirulence genes from Pseudomonas syringae pathovars phaseolicola and pisi confer specificity toward both host and non-host species. Physiol. Mol. Plant Pathol. 40:1-15. 4. Taylor, J.D., Teverson, D.M., Allen, D.J. and Pastor-Corrales, M.A. (1996) Identification and origin of races of Pseudomonas syringae pv. 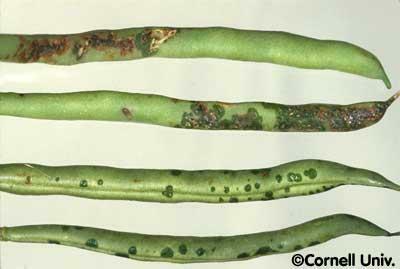 phaseolicola from Africa and other bean growing areas. Plant Pathol. 45, 469-478. 5. Tsiamis, G., Mansfield, J.W., Hockenhull, R., Jackson, R.W., Sesma, A., Athanassopoulos, E., Bennett, M.A., Stevens, C., Vivian, A., Taylor, J.D. and Murillo, J. (2000) Cultivar-specific avirulence and virulence functions assigned to avrPphF in Pseudomonas syringae pv. 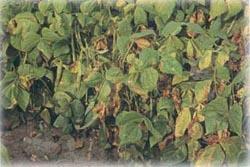 phaseolicola, the cause of bean halo-blight disease. EMBO J. 19, 1-11. 6. Stevens, C., Bennett, M.A., Athanassopoulos, E., Tsiamis, G., Taylor, J.D. and Mansfield, J.W. (1998) Sequence variations in alleles of the avirulence gene avrPphE.R2 from Pseudomonas syringae pv. phaseolicola lead to loss of recogition of the AvrPphE protein within bean cells and a gain in cultivar-specific virulence. Mol. Microbiol. 29, 165-177. 7. Young, J.M., Saddler, G.S., Takikawa, Y., De Boer, S.H., Vauterin, L., Gardan, L., Gvozdyak, R.I. and Stead, D.E. (1996) Names of plant pathogenic bacteria 1864-1995. Rev Plant Pathol 75, 721-763.